One of the most exciting parts of being a Subject Lead of English, has been the opportunity to design our curriculum. I think there has been a danger of overlooking curriculum in schools, particularly at KS3, when in fact it should be a number one priority. I’ve been lucky to work in an environment where it is taken seriously and where I’ve been given the chance to develop something I believe in. It’s over a year since I wrote about the initial stages of this: Curriculum Design – Taking the Leap. In that post I reflected on some of the thinking and research I had done in preparation for designing the curriculum. I was clear that it was an unfinished job; that it deserved more time and revisions along the way. Fifteen months later, it now does look somewhat different, although the key principles behind it stay firm. In this post, I explore the next stage of developing a curriculum. As part of a whole school focus on curriculum, we looked at ways to explain our subject curriculum visually: mapping out how we were building the essential knowledge of our subject over the years. 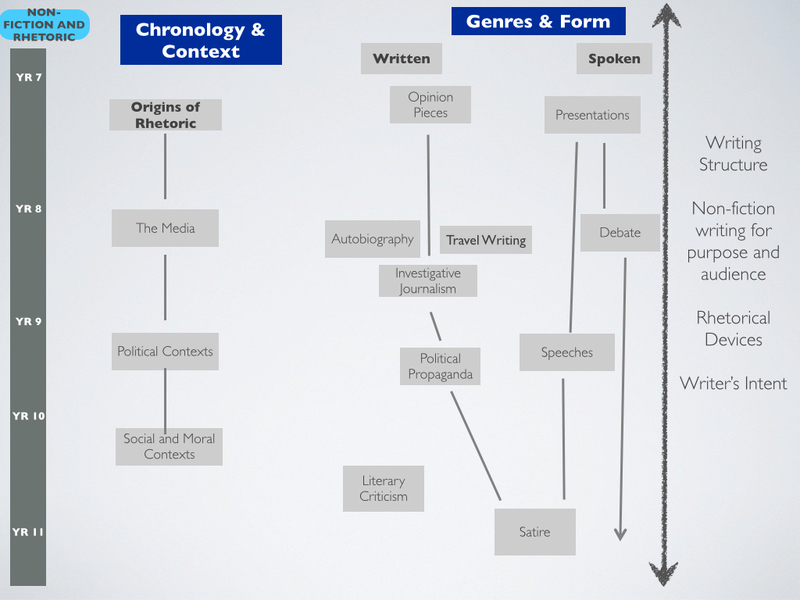 In English, I decided to focus on two concepts: Chronology and Context, Genres and Forms. One of the key components of the original curriculum design was trying to create a sense of chronology. I have now come to see this as an essential part of the English curriculum. Literature from all eras and genres contains allusions which presuppose a knowledge of literary history. 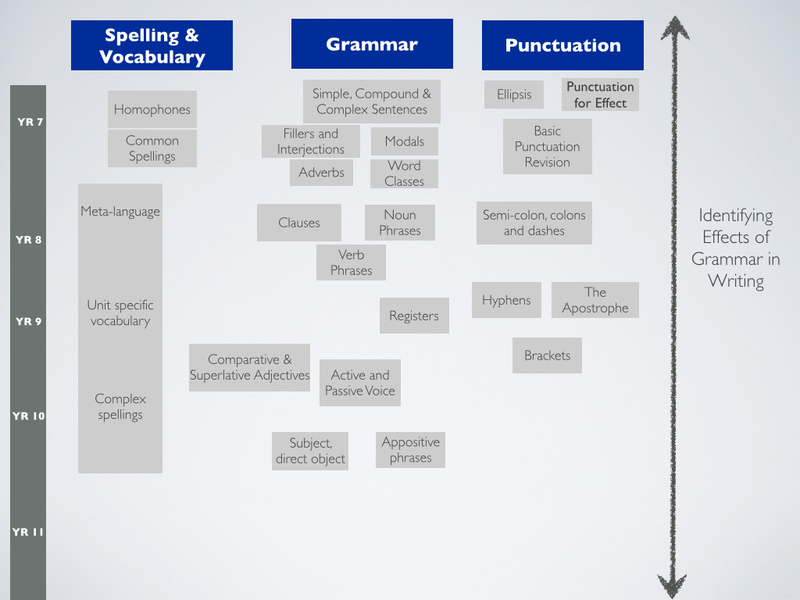 Studying language is made more fruitful and interesting by gaining a knowledge of the etymology of English language and it’s purposes and uses through the study of grammar and rhetoric. A knowledge of the foundations of both literature and language provides a launching pad for an in-depth understanding of all that follows. The fact that at ELSS the pupils also study Ethics (including Rhetoric and Ancient Philosophy) and Classics (including Ancient Literature and Latin) as part of their curriculum means they are getting a very rich understanding of literature and language. This doesn’t mean that curriculum becomes devoid of any study of contemporary texts or ideas – they can run happily alongside each other. For instance, in Year 7, a unit of poetry entitled ‘Poetry of Culture and Identity’ includes learning the key poetic movements and British Timeline of poetry, as well as exploring and creating poetry about pupils own cultural backgrounds. 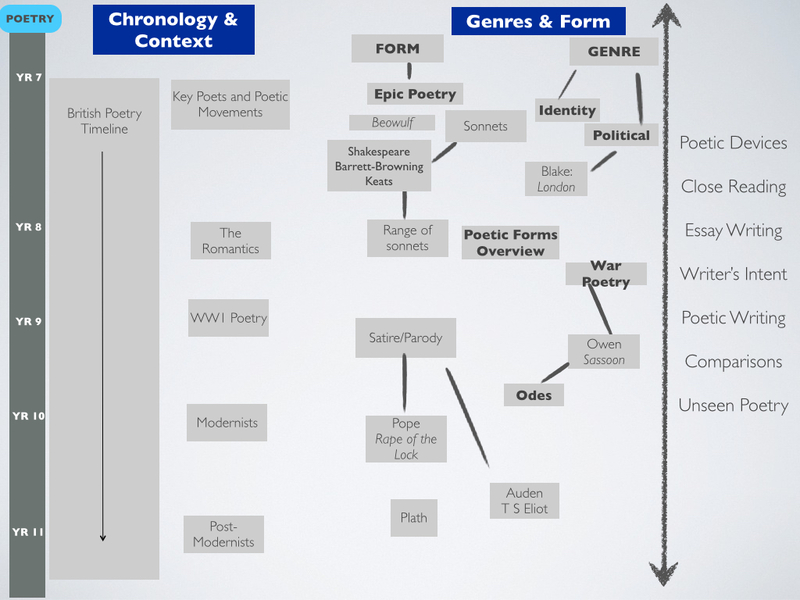 By examining ‘Genres and Forms’ pupils often need to understand chronology but also look across it to see how genres/forms have been developed and used. In our recent Year 8 unit of short stories, which was structured based on William Boyd’s Taxonomy of Short Stories, the taxonomy directed pupils to focus on the form of short story but naturally also explored chronology alongside this; we therefore looked at a range of stories from classics by Edgar Allan Poe and Anton Chekhov through to modern work from writers such as Marcus Sedgwick. As well as mapping the curriculum based on Chronology and Context, Genres and Form, I also divided it into five key areas of study. For each area, I mapped back from Year 11 to Year 7, considering how we would cover the material from the new National Curriculum and GCSE guidelines as well as the curriculum that I valued as a subject specialist. The procedural knowledge or ‘skills’ such as analysis/essay writing are taught in context, driven by the content. Each year continues to be linked by a philosophical question such as: ‘How Should We Live?’ or ‘Who’s in Charge?’ (these are not signalled on the maps but are explored with pupils). The maps give an overview, without containing all the detail of the curriculum. They are still, and to some extent will continue to be, works in progress. There are a number of reasons for this, such as specification choice altering text choice and order, as well as the fact that I am still reading and researching some curriculum areas such as Grammar to decide on the essential knowledge. 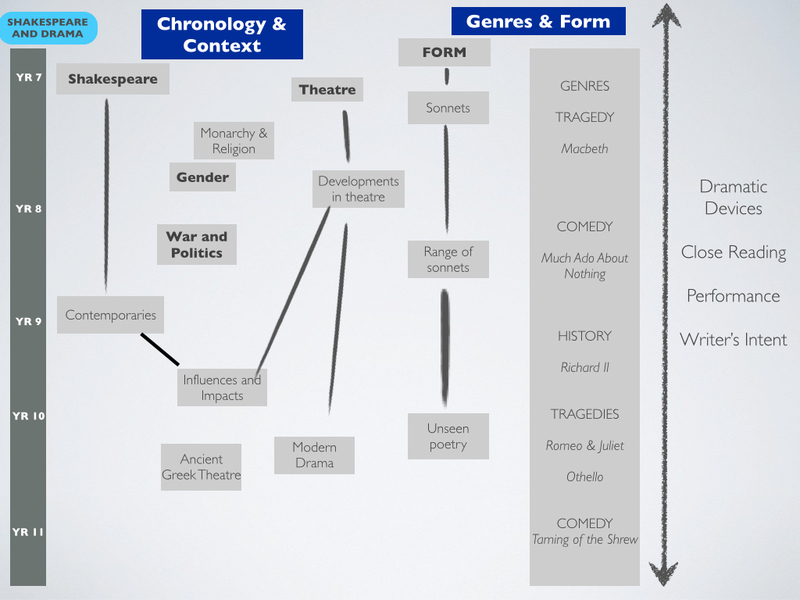 In Shakespeare and Drama, I am torn between play choice in the modern drama units of work and am also considering whether there will be space to re-visit Ancient Greek drama, or if this will have to be covered in Classics or in our Enrichment programme. However, I’m happy to share the maps at this stage as I think they still give a good indication of the journey of our curriculum. This post may also provoke some constructive feedback on how they can be developed further. At the end of each half term, pupils are tested on the unit of work they have been studying and given feedback as to how close they have come to conveying a strong grasp of the curriculum area, this includes specific feedback about five key areas of knowledge on which they are given formative feedback across the term. I explain our testing system in more detail in my post here, but it means that after each half term I have a clear understanding of what they have grasped and what they need help in. The curriculum model drives the assessment and means that they continue to pick up on elements they study; building upon their knowledge each year. We are currently in the process of reviewing our KS3 curriculum across the school, taking note of the strengths and weaknesses as found in the process of teaching and assessing it but also alongside new GCSE specifications. It’s been a fascinating process so far and I have been pleased to see positive responses from pupils both formally and informally. 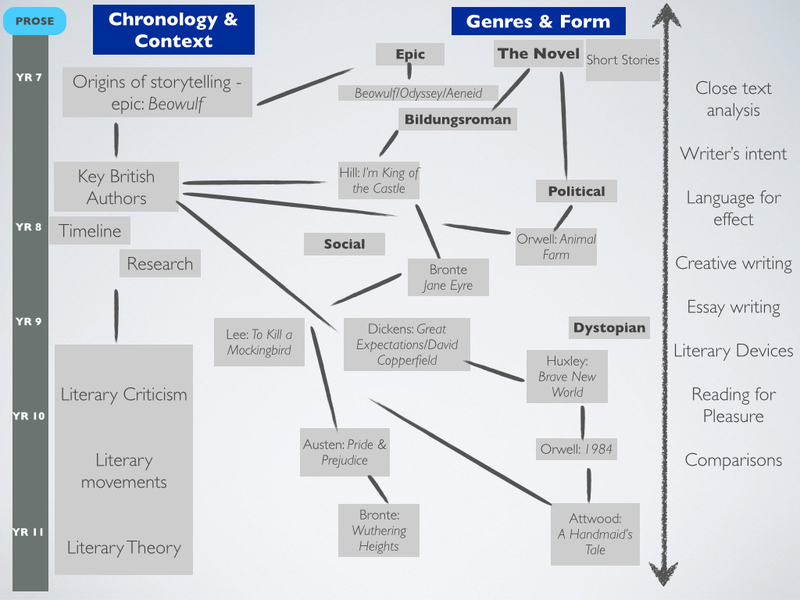 In their work, it has been amazing to see references to literary influences – they make natural comparisons between texts and are able to spot and analyse intertextuality – as well as seeing their confidence grow in dealing with challenging literary texts. I also have to admit to enjoying seeing them exchange witty insults from ‘Much Ado About Nothing’ and ‘Macbeth’ in their conversation outside class. Plus I can’t help but feel that the curriculum must be working when they cheer about reading time in the library, beg to be allowed to learn poems off by heart and rush with sheer excitement across the British Library to see the manuscript of ‘Beowulf’. I know my work isn’t done and there is always more to consider, but I feel confident that we’re heading in the right direction. This entry was posted on February 20, 2015 by ragazzainglese in Education (general).